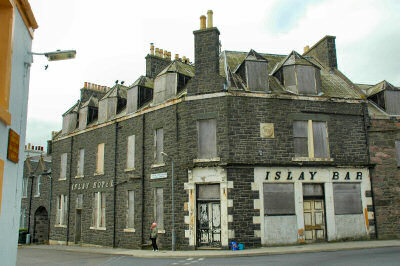 Many people will remember the sad sight of the old Islay Hotel in Port Ellen. After it had closed the building hadn't been maintained and over the years the wind and water had taken their toll. Certainly over the last 10 years of its existence it had started to turn into an eyesore, even though some developed romantic views about the building. After many problems including securing sufficient water supplies Roland Worthington-Eyre was finally able to kick off the project to rebuild the hotel in summer 2007. On this page I will try to document the progress of the project with panoramas of the site at various stages. To view them in their full glory you will need the Apple QuickTime plugin installed on your PC. The previews on this page give you an impression of what to expect, follow the links under the previews for the full experience. Note: Most of the panoramas are quite big, depending on your connection speed they might take a while to download. Late October 2007: The demolition of the old hotel had been completed in mid September 2007. This panorama shows the foundations being laid and work on the basement under way. See more on the Islay Hotel building site Port Ellen, Isle of Islay, October 2007 - 180° Quicktime VR Panorama. Mid April 2008: A lot of progress was made even during the winter. This panorama shows the ground floor nearing completion with a number of features of the building starting to be recognisable. See more on the Islay Hotel building site Port Ellen, Isle of Islay, April 2008 - 180° Quicktime VR Panorama. Mid July 2008: During the early summer months a lot of progress was made. This panorama shows the first floor nearing completion and the second floor being kicked off. This is where the guest rooms will be. See more on the Islay Hotel building site Port Ellen, Isle of Islay, July 2008 - 180° Quicktime VR Panorama. Late October 2008: During the late summer months more progress was made. This panorama shows the first floor completed and the second floor progressing quickly. The roof is scheduled to be completed soon. See more on the Islay Hotel building site Port Ellen, Isle of Islay, October 2008 - 180° Quicktime VR Panorama. Mid April 2009: Not as much progress visible as in previous panoramas as over the winter most of the work took place inside the building. Nevertheless progress is clearly recognisable at the second floor with the roof almost complete. See more on the Islay Hotel building site Port Ellen, Isle of Islay, April 2009 - 180° Quicktime VR Panorama. Mid June 2009: With only two months between the panoramas not much progress is visible from the outside. Yet if you look closely you can spot subtle differences like more progress on the roof. See more on the Islay Hotel building site Port Ellen, Isle of Islay, June 2009 - 180° Quicktime VR Panorama. Mid October 2009: What a difference six months can make: The scaffolding has finally come down, most of the windows have been added and much more. See more on the Islay Hotel building site Port Ellen, Isle of Islay, October 2009 - 180° Quicktime VR Panorama. Mid April 2010: More excellent progress even though some of the scaffolding has come back. The wings have been painted and large parts of the entrance have been completed. See more on the Islay Hotel building site Port Ellen, Isle of Islay, April 2010 - 180° Quicktime VR Panorama. Mid June 2010: Some further progress in the entrance area, the windows have been fitted and the scaffolding has been removed again. See more on the Islay Hotel building site Port Ellen, Isle of Islay, June 2010 - 180° Quicktime VR Panorama. Late October 2010: Some further progress in the entrance area, the walls have now been painted and only the door and a few signs are still to be done. See more on the Islay Hotel building site Port Ellen, Isle of Islay, October 2010 - 180° Quicktime VR Panorama. Late April 2011: No real dramatic changes any more now, some of the fittings are completed and only the main door and name sign are outstanding. See more on the Islay Hotel building site Port Ellen, Isle of Islay, April 2011 - 180° Quicktime VR Panorama. Back of the hotel, mid July 2008: Taken on the same day as the panorama above from July 2008, a view of the back of the hotel. Gives an impression where the restaurant will be as well as most of the guest rooms. See more on the The back of the Under Construction Islay Hotel, Isle of Islay, July 2008 - 180° Quicktime VR Panorama. Back of the hotel, late October 2008: Taken on the same day as the panorama above from October 2008, a view of the back of the hotel. Good views of the second floor with the roof starting to take shape. See more on the The back of the Under Construction Islay Hotel, Isle of Islay, October 2008 - 180° Quicktime VR Panorama. Back of the hotel, mid April 2009: Taken on the same day as the panorama above from April 2009, a view of the back of the hotel. The progress is much more visible than from the front with the second floor now completed. See more on the The back of the Under Construction Islay Hotel, Isle of Islay, April 2009 - 180° Quicktime VR Panorama. Back of the hotel, mid October 2009: Taken on the same day as the panorama above from October 2009, a view of the back of the hotel. The scaffolding has come down here as well and work on the extension for the bar and restaurant is well under way. See more on the The back of the Under Construction Islay Hotel, Isle of Islay, October 2009 - 180° Quicktime VR Panorama. More to come over time, as the work on the hotel progresses and I get the chance to take pictures for further panoramas during my visits to Islay. If you like panoramas and Islay you might also be interested in some other panoramas from Islay. For more QuickTime VR panoramas you might also be interested in my 360° QTVR panoramas from Islay or my 180° QTVR panoramas from Islay. Not to forget my Islay distillery panoramas for the whisky fans.